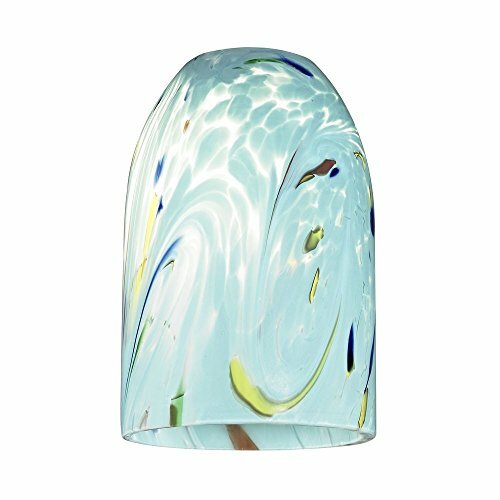 Dome Art Glass Shade in Turquoise - Lipless 1-5/8-Inch Fitter Opening Art glass shade in a turquoise color with bursts of yellow, blue, green, burnt orange, and clear throughout. The glass measures 4-inches on the bottom, by 1-5/8 inches on the top, and 6-inches in height with a fitter opening of 1-5/8.This replacement glass shade is meant to be installed on fixtures with a medium base socket. A socket ring is required if installed facing down. If installed facing up a socket ring may not be required. 6 in x 4 in. Design Classics Dome Art Glass Shade in Turquoise - Lipless 1-5/8-Inch Fitter Opening Lamp - 6 in X 4 In.